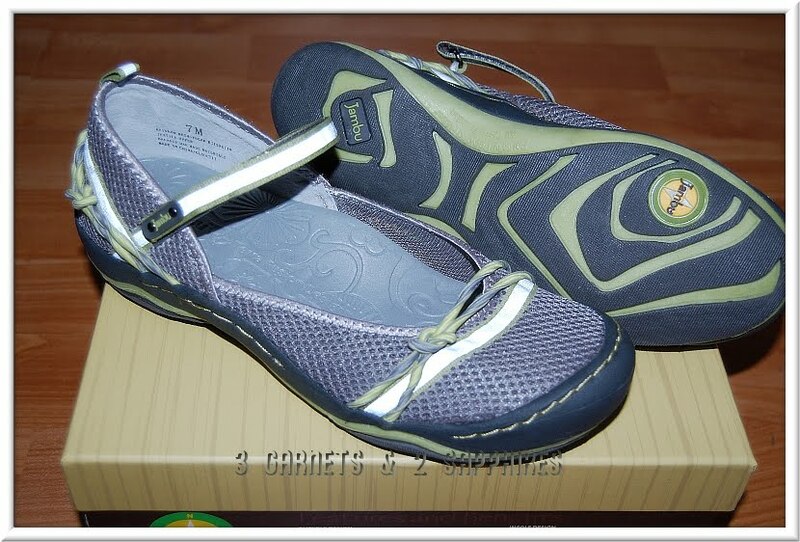 Having tried and fallen in love my first pair of Jambu shoes last fall, I was eager to test out a pair for the warmer months, during which comfort is key for someone like me, whose favorite season is autumn. Over the past year, I have gradually replaced my less-than-comfortable heeled shoes with flat-soled shoes. I have purchased several pairs of sporty flats, but I am having a difficult time adding to that collection because they are all starting to look too similar. That is why I chose these Rainbow Mesh - Vegan Flats in Pistachio for myself. Like all other Jambu shoes, these have a unique look due to the attention to detail that Jambu has come to be known for . . . In addition to grey being one of my favorite colors lately, what really attracted me to this shoe is the two-color twisted and knotted cording that spans the the heel and the vamp. This is such a unique detail. Also, this shoe has reflective strips across the Velcro strap, on the heel, and across the vamp, but these strips simply look grey like the rest of the shoe until light is directed upon them. This makes the shoe look slightly less sporty, making them suitable to wear with a causal dress or skirt. I wore the Jambu Rainbow Mesh shoes to my son's soccer game during a very unusual heatwave last week. With other shoes, I have had the problem of their becoming uncomfortable the longer I wear them because my feet tend to expand slightly when I am warm and I have been on my feet for awhile. I did not have any problems with this shoe because my feet never felt hot. 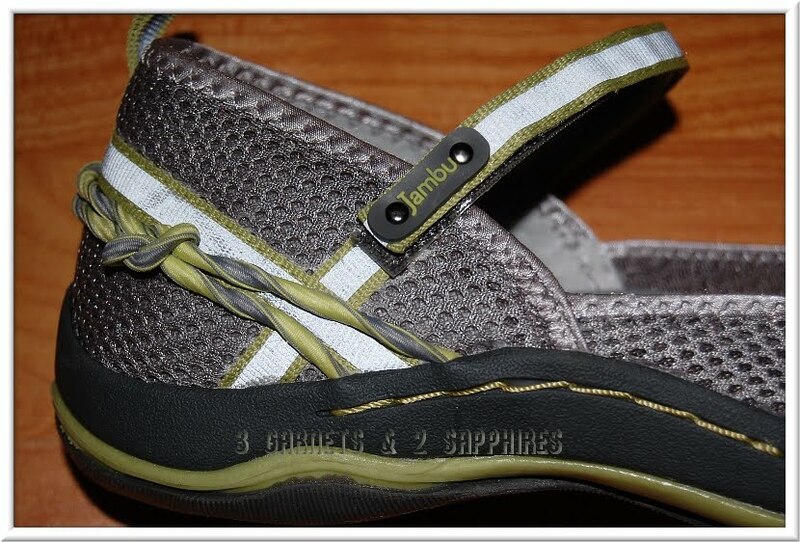 The mesh, as promised by Jambu, is very breathable. Between the memory foam footbed, the rubber outersole and toe bumper, and the extremely secure Velcro strap, this shoe was comfortable enough for me to wear while warming up with my son before the soccer game. Besides the style, comfort, and wearability of their shoes, Jambu is also known for its efforts to produce eco-friendly shoes. The Jambu Vegan line of shoes is 100% animal-friendly. The outersoles on all the shoes are made of partially recycled rubber. 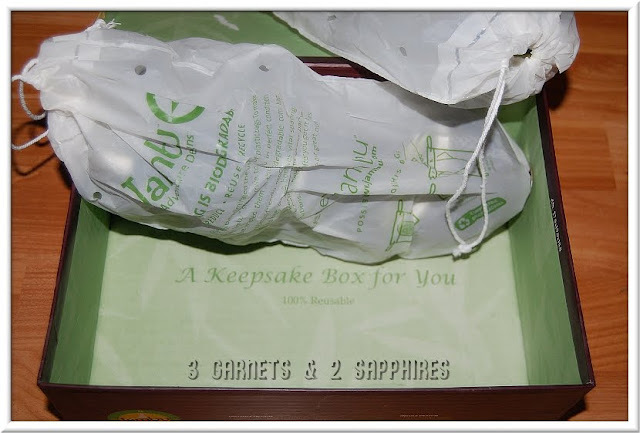 The sturdy reusable shoe box is 100% recycled and recyclable, as are the accompanying shoe bags. 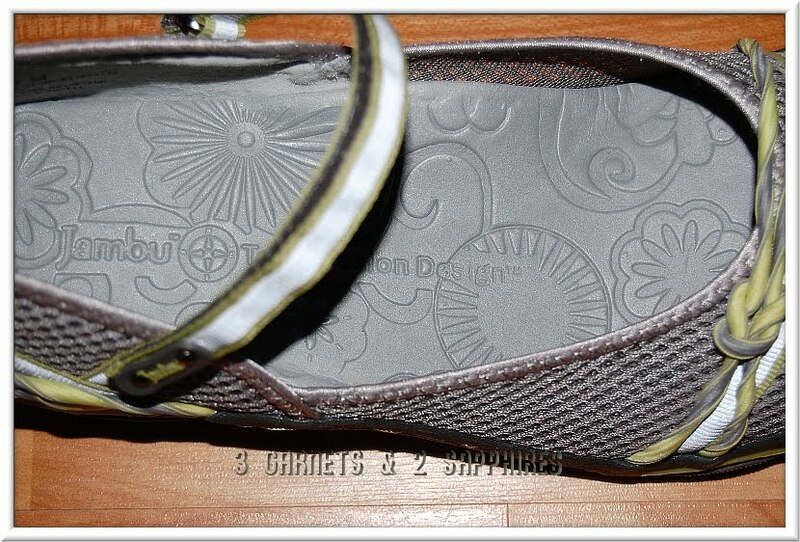 The Jambu Rainbow Mesh - Vegan Flat retails for $99. To learn more about Jambu, visit Jambu.com and the Jambu Adventure Designs blog, as well as Jambu on Facebook and on Twitter.